Since its inception, Associated Bank has had a rich tradition of providing superior financial services to the communities it serves. As an extension of that commitment, Associated is dedicated to strengthening communities through focused corporate giving and employee volunteerism efforts. 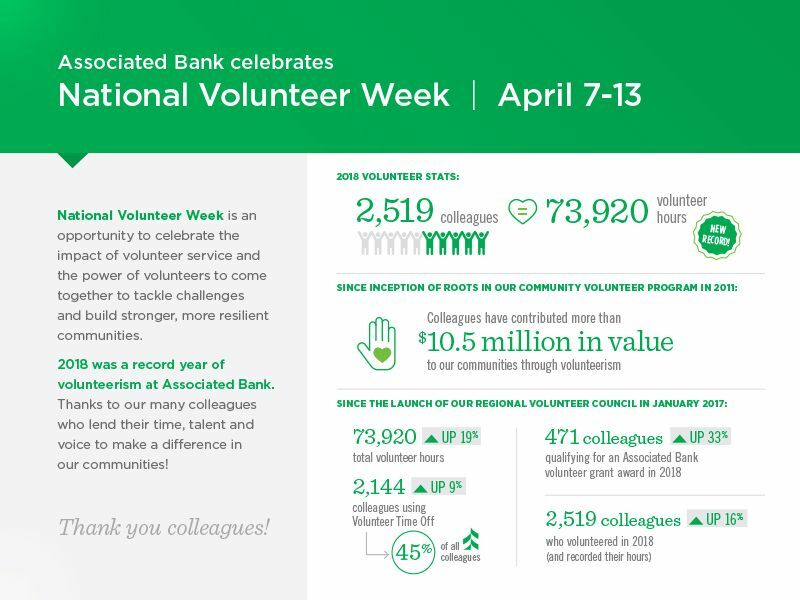 Associated’s Roots in Our Community volunteer program empowers colleagues to give generously of their time and resources in the communities they live. To help foster an environment of giving, Associated offers flexible working arrangements to its colleagues and provides special recognition and rewards for outstanding service to non-profit organizations. National Volunteer Week is an opportunity to celebrate the impact of volunteer service and the power of volunteers to come together to tackle challenges and build stronger, more resilient communities.